Midfielder Hannes Burmeister runs down the field on the attack for another goal during a game against University of Memphis, Aug 28. Germany is well known around the world for its soccer talent, especially after winning the 2014 FIFA World Cup. So it’s no surprise that the Panthers would scout overseas for their future athletes, and finally it’s paying off with midfield starter Hannes Burmeister. Burmeister is from Bentwisch, Germany and has been playing soccer ever since he was little. At an early age growing up in Germany he developed a passion for soccer before he even went to grade school. Burmeister played soccer every year after being released from his first club. His team finished as the German Vice-Champion in the U-19 soccer competition in 2013 and he also played for the Football Club Hansa Rostock II. After graduating grade school in Germany, Burmeister had a tough decision to make. Go play overseas in the states or stay back home. Burmeister made his decision to play overseas, and the only thing left for him to decide was where to play. He didn’t want to just choose any school, but rather a school that he felt would fit him best in terms of soccer and academics. Just because Burmeister made the decision to take his talents to Georgia State, doesn’t mean that there wouldn’t be any negatives to playing overseas. After deciding to play overseas, Burmeister wasn’t able to play the first five games of his freshman year because he didn’t receive NCAA clearance yet. 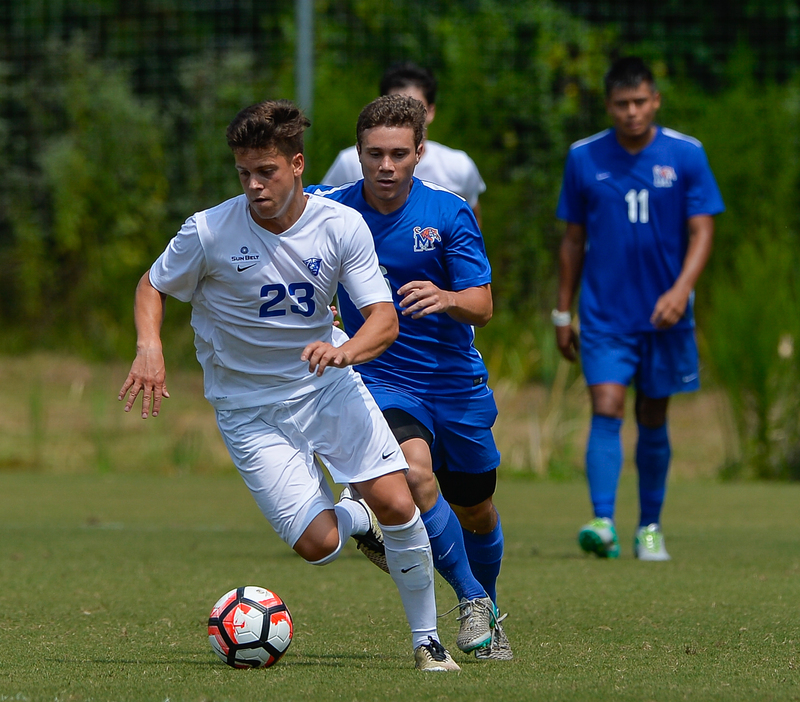 Not being able to practice with team and get used to Division I soccer gave Burmeister a shaky start to his Georgia State career. Burmeister played 13 games his freshman year and started 11 of them. He had four goals on only 12 shots on the season and contributed one assist. Burmeister realized during the season that soccer in the states was different than in Germany. Still despite his shaky start, Burmeister kept getting better and helped the Panthers come back from a 3-0 deficit against Georgia Southern in the Sun Belt Conference Semi-Final round. Burmeister scored the third goal to force the game into penalty shootouts. The Panthers won the shootout 5-4 and advanced to the championship where they would fall to Hartwick 3-0. The fact that the Panthers were 9-8-1 and still made it to the Sun Belt Championship, showed the potential for this team and for Burmeister. Burmeister is coming into his sophomore season and with a year of experience with the team and playing Division I soccer he feels that he can only progress. To say Burmeister is off to a hot start this season would be an understatement. In just six games into the season, Burmeister has seven goals and has hit 10 of his 15 shots on goal. In addition, Burmeister has won back-to-back Sun Belt Offensive Player of the Week awards have scoring two hat tricks, one against Memphis and the other against Lipscomb. That “another mentality” and “I’m not done yet” attitude is exactly the kind of leadership this Panthers team needs. And Burmeister’s leadership is paying off with redshirt-freshman Oliver Haines. In the game against Central Arkansas this season, Haines scored his first two goals of his career and helped the team get a 3-1 win. His first career goal came off of an assist from Burmeister. With Burmeister playing so well, he is able to give his other teammates more goal chances such as freshman player Haines. This team has a lot of potential with Burmeister leading the way. Hopefully they can show off that potential this season. After a hot 3-1 start for the Burmeister and the Panthers, they seemed have to lost their finishing touch as they’ve lost their last two games and are now 3-3. In those two losses, the Panthers have outshot their opponent 26-19, but their opponent’s goalie combined for eight saves. The Panthers won’t start conference play until Oct. 8. Hopefully Burmeister can bring back that finishing touch to the Panthers before then.